Anyone who lives or has driven around Grand Rapids, MI knows about State Highway 6. This bypass from I-196 to I-96 saves time, is the “quick way” to the airport if you live south of Grand Rapids, and has been a source of conversation the past few years. It is well known that something went wrong when the concrete was originally poured in the late 90’s, yet the highway, especially the portion from I-196 to Byron Center Avenue, was allowed to decay until this summer 2017. The degradation of the road is centralized around the cut joints in the concrete, spread fourteen feet apart for much of the highway. The impact of these damaged concrete joints could be felt and heard throughout the vehicle. This made the drive particularly miserable for both the vehicle operator and any passengers, but what effects did this have on the actual vehicle? Anytime a vehicle is being driven it is being damaged in some way. Automotive manufacturers design and test vehicles to withstand an amount of damage, on average, per mile. They use a variety of different road conditions and approximate how many miles of each condition the vehicle will be exposed to in its lifetime. The question that we ask today is, if the repaired section of highway is a “normal environment” how much additional damage was applied to my vehicle for each mile driven on the old M-6? The western 4 miles of highway was in the worst condition until the summer of 2017 when all 4 lanes were torn out and replaced with new asphalt. With the expectation that the road was going to be fixed, engineers from Vibration Research Corporation set out to conduct a small case study. The goal being a simple comparison of the damage being caused to vehicles by operating on the old highway vs. the new highway. Using Vibration Research’s ObserVR1000 data acquisition hardware and triaxial accelerometers from Dytran Instruments, recordings of the road vibration were made before and after the section of road was repaired. Using those recordings and some unique analysis methods, the Vibration Research engineers reached some interesting conclusions. Several recordings were generated via multiple passes across the 4-mile section of road, in both directions, using a 2016 Chevy Silverado 1500 truck. The measured road vibration recordings were evaluated independently using accepted industry means. There are a few minor discrepancies where the old road is less damaging than the new at certain frequencies. One specific point is in the Y-Axis (horizontal and forward) at approximately 13.7 Hz. This frequency is the wheel speed, so any differences in speed throughout the recording cause this point to shift. The concrete joints on the old road were spread 14 feet apart. At 65 MPH, a driver would cross 6.8 joints per second, meaning the impact frequency at 65 MPH is 6.8 Hz, at 75 MPH the impact frequency is 7.8 Hz, and 80 MPH equates to 8.3 Hz. 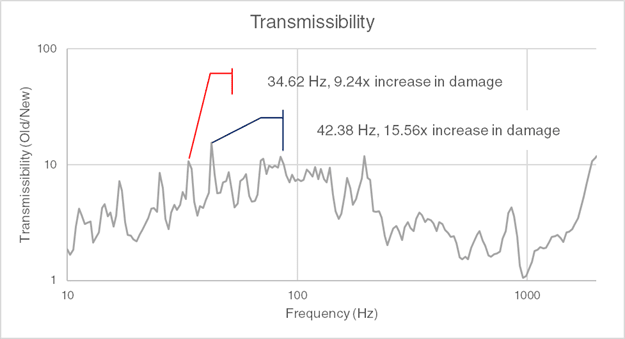 When a vehicle is exposed to these types of impact events, the actual frequency of the impact is not necessarily the key, rather the higher frequency content that is generated from this type of exposure. 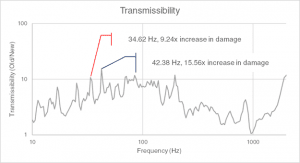 This high frequency energy is much more likely to excite resonances in the vehicle components causing additional damage. If, for instance, the vehicle had a component that had a natural resonance of 34Hz, the damage difference is approximately 10Hz and the average driver crosses this section of highway 4 times per week. On the old road conditions, with the 10x damage multiple, at 34 Hz, the vehicle experiences nearly 4000 miles of damage in 400 miles of actual driving. The data clearly shows that there was significantly more damage being applied to the vehicle due to the degraded condition of the highway section. There is no point between 10 and 2000 Hz, the typical frequency range used for automotive testing, where the old road is less damaging or even equally damaging as the new road. This would mostly affect the suspension components and bushings inside of the vehicle as they are most prone to low frequency damage. This comparison serves as an example that state, county and city officials could use to determine which roads need to be replaced or repaired. It could also be used as a reference tool to determine the rate of degradation a road experiences year after year and as more data is collected could be utilized to more efficiently predict when road sections will need to be repaired or replaced. This would allow for more efficient budgeting and work from local to national levels.